The Mongoose 70S is KYMCO’s smallest ATV, with built-in adjustable controlled speed limiters for parents’ and riders’ maximum confidence and control. 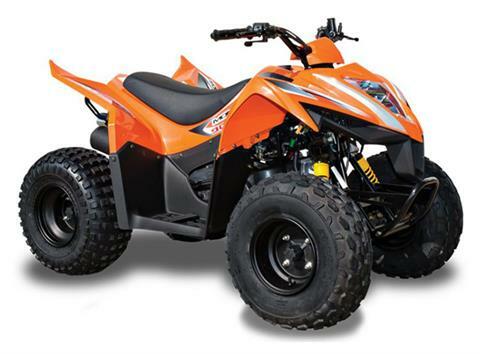 The Mongoose 70S is designed to maximize fun and parental controls, this youth-sized sporting ATV is for the youngest beginners challenging their local terrain. Powered by an air-cooled, carbureted 69cc, 4-stroke engine, with automatic CVT with F-N,, the chain-drive Mongoose 70S features single a-arm front and swingarm rear suspension, with preload adjustable shocks. Tires are 16 x 8-7 and braking is provided by front drum and a rear disc with safety lock. Electric start makes it easy to motor on away, and auto-stop safety lanyard kill-switch, screw-type throttle limiter, and a CVT collar allow speed and power limits to be set for young rider’s skill and experience. Available in Black or Orange. ANSI/SVIA Rated Y6 – The Mongoose 70S is recommended for riders 6 years of age and older. Mongoose 70S riders younger than 16 years of age must be supervised by an adult, and should take a training course.